As I’m writing this today, many factors and realities come into play such as the grey trend with high chroma finishes and hard surfaces that are still a huge factor in the overall design of Condo and townhouse units today; Vancouver’s hot and climbing real estate; new developments springing up daily; or just plain old affordability for many people. Combined, these factors along with many others not mentioned here have customers feeling the push and panic at the thought of living in a smaller space. The ones I’ve been thinking about a lot lately and am focusing on are the ones who have spent a lifetime working and building towards their retirement, or are already in it. These customers have sold their very large houses where they have raised their families, created memories and for most of them, this is a very emotional decision. All of these factors are major contributors to their uneasiness about their future new home and what that will look like for them. Our job as designers for La-Z-Boy is to listen to their concerns, make them feel excited and confident about their new home, and purchases. To also assure them that in most cases we can help them create a space that accommodates family and larger gatherings; the children away at college; boomerangs; their grandchildren and of course their fur babies; on a smaller scale of course. It’s amazing and rewarding to me to experience the difference when we’re able to do that for them. Fortunately for us at La-Z-Boy, we have an amazing selection to choose from to complete this room depending on what the customers’ needs are. In most cases, these customers feel like they are going to have to compromise comfort, size and style and durability. Not the case. We also have a multitude of fabrics, performance fabrics and leathers to meet these requirements. Our first task as designers is to pay attention to the placement and dimensions of windows, fireplace and TV location, and items from their home that they will be keeping. Once we know the aforementioned, we can move on to setting up the room. Focus on larger pieces first such as deciding if you want a sofa, sleep sofa, or small sectional with a chaise? Instead of the typical sofa/ loveseat configuration, consider either a stationary, swivel or reclining chair. Keeping the overall space and design in mind, as well as whether your space can accommodate reclining furniture, I often ask customers where they will be sitting. I get many puzzled looks when I ask that question, but the reason I do is this is dependant on their budget and who will be using the room. An extremely valuable item in a living room! Versatile in style, use, and finish and they can take the place of a chaise on a stationary sofa. Another great use for ottomans is to use them as a coffee table with a tray. Storage ottomans are also something to consider because the extra space is welcomed in smaller spaces. Have you thought about extra seating? Choose a coordinating fabric to make it part of the overall décor. This can be placed anywhere as an accent piece and moved around when you want a fresh look. In most cases, customers are looking for something that fits in their space, as well as a piece that can work for just them when they are alone and accommodate large gatherings when needed. 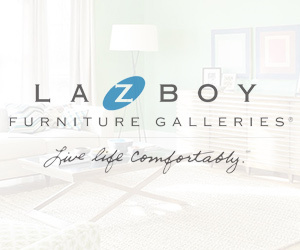 At La-Z-Boy, we have an amazing selection of dining furniture to choose from. Our products are available in many styles, colours, and finishes. Most of our dining room tables have a drop leaf in the center to allow for larger gatherings. If you have a larger space to fill, there are matching hutches, sideboards, chairs, and stools with a choice of fabric colours/ patterns. The selection for master bedrooms is endless! Are you looking for cohesiveness in your overall plan, or do you want to choose a completely different style? The first thing to find out is what you’re envisioning for this room. Is it being used as a second bedroom, a guest bedroom, a tv room or home office? Let’s say we are styling a guest bedroom but you also want o use it as a home office. My first go-to for this is to decide if we’re going to use a sleep sofa with either a loveseat or half-chair. This decision is important because it will allow you to enjoy the space when you don’t have a guest. To complete the room and dependent on the size, I would consider adding bookcases, end tables, carpets, lighting, and accessories All of these items contribute to making this room a multi-functional space. Quite a few of our customers are moving from a very large family home to beautiful waterfront condos or townhouses. When you have a gorgeous view, you’ll want to make it the focal point and choose pieces that won’t obstruct the scenery. Low-height sectionals, sofas, stationary chairs, and recliners are key. Others who are moving into spaces that don’t offer as much light, where the walls are darker and the layout is different, we do our best to create the same experience for each one of them during this transition no matter what their new home looks like. With the help of the In-home Design Professionals and the Design Consultant Team at La-Z-Boy Furniture Galleries and the endless selection of products available to us, we can take our customer from panic to excitement one room at a time. Is it fall season? Try using some orange hues to bring the room together.